Halloween Ring. Witch Ring. Black and Orange Ring. Adjustable Size Ring with Happy Witch Button and Bronze Ring Base. Handmade Jewelry. 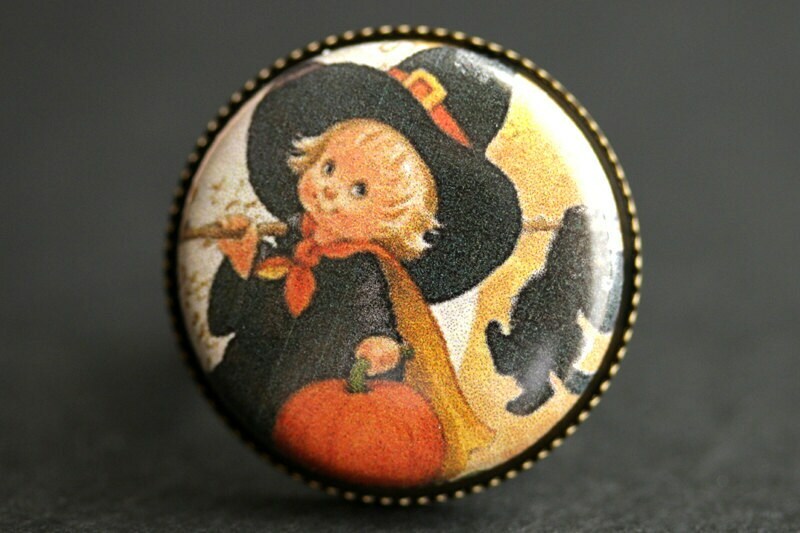 A cute little witch in vintage design graces the face of the button that has been set upon an adjustable size bronze ring base in this handmade ring that's adjustable from size 7 and up. The adjustable sizing of this Halloween ring makes it comfortable no matter the size of the wearer's fingers as well as ideal for switching from finger to finger depending on mood or preference. Spring Mandala Ring. Flower Mandala Ring. Button Ring with Adjustable Ring Base. Handmade Jewelry. Cocktail Ring: Tigers Eye Swirl Glass Stone Ring with Adjustable Ring Base. Handmade Jewelry. Orange Pumpkin Ring. Halloween Ring. Filigree Ring. Adjustable Ring. Gold Ring, Silver Ring, Bronze Ring, or Copper Ring. Halloween Jewelry. Pumpkin Ring. Halloween Jewelry. JackoLantern Ring. Halloween Ring. Jack o Lantern Ring. Adjustable Ring. Bronze Ring. Handmade Jewelry. Raven Ring. Halloween Ring. Goth Ring. Edgar Allan Poe Ring. Black Bird Ring. Silver Adjustable Ring. Halloween Jewelry. Handmade Jewelry. Pumpkin Ring. Halloween Jewelry. JackoLantern Ring. Green Ring. Halloween Ring. Jack o'Lantern Ring. Silver Adjustable Ring. Handmade Ring. Autumn Amber Ring. Amber Rhinestone Ring. Button Ring. Bronze Ring. Adjustable Ring. Handmade Ring. Handmade Jewelry. Black Mum Flower Ring. Black Chrysanthemum Ring. Black Flower Ring. Adjustable Ring. Handmade Flower Jewelry. Brown Cat Ring. Cat Button Ring. Cartoon Cat Ring. Button Ring. Silver Ring. Bronze Ring. Adjustable Ring. Handmade Ring. Handmade Jewelry. Dark Red Glass Ring, Bronze Ring. Brick Red Ring. Lampwork Glass Ring. Cocktail Ring. Adjustable Ring. Handmade Jewelry. Bronze Flower Ring. Flower Button Ring. Bronze Button Ring. Flower Ring. Adjustable Ring. Bronze Ring. Handmade Ring. Flower Jewelry. Flower Button Ring. Bronze Flower Ring. Bronze Button Ring. Flower Ring. Bronze Ring. Adjustable Ring. Handmade Ring. Flower Jewelry. Ruby Red Glass Ring in Bronze. Red Ring. Bronze Adjustable Ring. Handmade Jewelry.